germandolls: Is it really Fall? As I am bringing in red tomatoes from the garden every day I am wondering where fall is. Sure the leaves are falling off that big old oaktree in front of the house. But really, we are well into the first week of October and sweating in Colorado. Every day temperatures have been in high 80s I believe there even was a day when my car thermostat claimed 90s. How can people still deny that global warming is a fact? It boggles the mind. I really miss fall in Germany. The rain, the foggy cold days, and picking grapes. I think I have shared some pictures of childhood fall memories from Germany with you. Now I have to close my eyes and leave it up to the imagination. 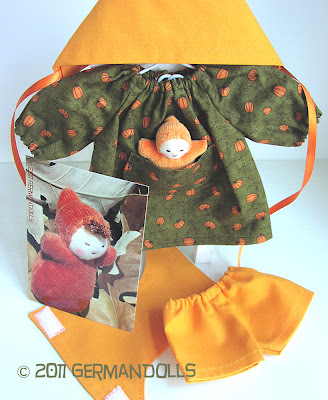 Maybe if I keep sewing fall dollclothes fall will actually come? Longing for the cold I put together this cute set for my shop.